In this blog, you will find the results of a survey I ran that highlight what I consider some interesting trends in online marketing and product launch strategies. I conducted this survey over a two month period. I asked every person who downloaded my book “Launch Hacks” (you can pick up a free copy of the book here) to fill out the survey. We had about 6,000+ people download the book, and about one hundred filled out the survey (or at least that’s where we cut off additional submissions to compile the results you’ll find in this report). I created this survey to better understand the needs and pains of my audience, and corresponding solutions they were most interested in learning. I thought about keeping this private (just for my team’s internal use), but as I began compiling and analyzing the data, I thought it might be interesting to share this non-scientific study with my readers, simply because some of the results were not what I expected. For example, I am aware of the effectiveness of each of the strategies from “Launch Hacks,” how simple they are to implement, and the type of ROI one might get from implementing them, because I’ve used these strategies for myself and for clients to generate tens of thousands of leads and millions in sales. So you might expect the strategies that provide the greatest ROI would be voted most ‘useful,’ but that’s not how things seemed to pan out. Complexity and relevance seemed to play a much bigger role in how people voted. 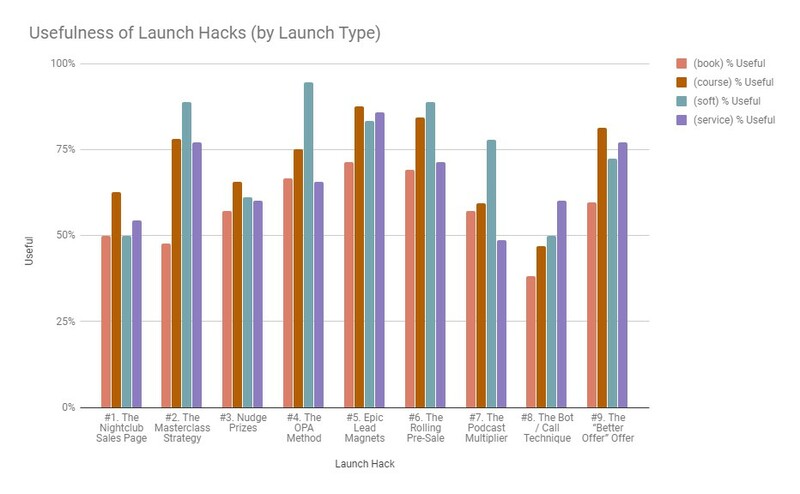 Please note: I share this report as a complimentary resource for my book “Launch Hacks.” I recommend reading “Launch Hacks” first, and having it open when you read through this report, so you can draw your own conclusions and identify your own trends from the results (without it, the results may be a bit confusing). First, let’s talk about the ‘launch hacks’ in question. #1. The Nightclub Sales Page – a technique for getting people interested and eager to buy. Great for increasing optin and sales conversion rates (lead capture / lead conversion). #2. The Masterclass Strategy – a way to sell high ticket offers (lead conversion). #3. Nudge Prizes – a strategy for increasing the effectiveness of affiliates who market and sell your product (lead generation). #4. The OPA Method – a simple but powerful way to increase your reach (lead generation). #5. Epic Lead Magnets – a technique for increasing optins, subscribers, and/or signups (lead capture). #6. The Rolling Pre-Sale – a strategy for generating sales of products an services before they’re live, in a way that can be done in an ongoing manner (lead conversion). #7. The Podcast Multiplier – a way to get more exposure and traffic from podcasts (lead generation). #9. The “Better Offer” Offer – a strategy for increase sales, revenue, and profit (lead conversion). Now let’s take a look at the overall survey results. Most Useful – These are hacks that received the most number of ‘Useful’ votes. Most Lopsided – These are hacks that have the highest number of ‘Useful’ votes and the lowest number of “not useful” votes. So if something is ‘Most Lopsided’ I mean that it was viewed in a strong, positive light. Most Extreme – These are hacks that have the highest number of ‘Useful’ votes and highest number of “not useful” votes. I look at the ‘Most Extreme’ as those strategies that are either contentious (which to me would mean they are either extremely relevant and useful, or not at all, depending on who is voting). I figured these areas might shine some light on typical problem / solution sets shared by entrepreneurs and business owners, and was curious how they might shift based on what they wanted to launch. Across all launch types, “#5. Epic Lead Magnets” generated the most amount of ‘Useful’ votes. To some degree, I was surprised that this was the most popular hack. That’s because I considered this a fairly simple lead generation strategy that most people would already know about, and probably had already implemented. I figured some of the more ‘cutting edge’ hacks would have generated the greatest number of ‘Useful’ votes, but that wasn’t the case. In the end, I am reminded that simple almost always beats complex, regardless of potential upside. The results here do not surprise me. That’s because this hack is more complex than many of the others. It requires the use of two unique marketing and sales channels: a Facebook Bot for lead generation, and a phone sales team to close the sale. I figured the complexity of this hack would prove difficult for many to implement, and that it wouldn’t be applicable to many (or most) readers. This seems to be the case. Based on additional survey results (feedback form), it also seems that most people aren’t sold on Facebook Bots, and would prefer to avoid the necessity of a phone sales team to handle sales. I’m somewhat surprised “#1. The Nightclub Sales Page” received so many ‘N/A’ votes. That’s because I believe this is a hack anyone could implement in a matter of minutes or hours, and start seeing more sales (assuming they’re already getting the traffic). Further, I thought this hack could be applied to any sales page, no matter what you’re selling – so I expected more ‘Useful’ or even ‘Not Useful’ votes, but that wasn’t the case. Instead, most people just dismissed it. “#5. Epic Lead Magnets” didn’t just achieve the greatest number of ‘Useful’ votes – it also had the least amount of ‘Not Useful’ and ‘N/A’ votes, making it a clear winner of ‘Most Lopsided’ hack. Somewhat surprisingly, “#2. The Masterclass Strategy” proved to be the most contentious hack, with the greatest number of people voting ‘Useful’ and ‘Not Useful.’ In other words, people either saw it’s utility, or saw that it wouldn’t help them at all (very few voted ‘N/A’). As part of the survey, I requested that each person identify what they wanted to launch (what I refer to in this report as ‘launch type’). Individuals could select between: book, course, software, or service (and could choose more than one). 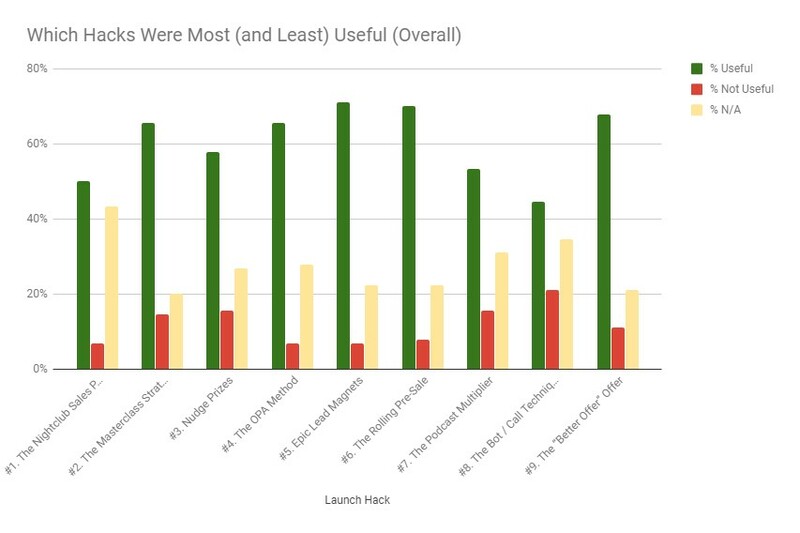 Interestingly, people who wanted to launch a ‘book’ weren’t convinced of the utility of these hacks compared to those marketing and selling courses, software, or services (and hence did not overwhelmingly vote any of the hacks as ‘most useful’ compared to those launching other things). Overall, individuals who are launching a book follow the overall trend, with one exception: “#6. The Rolling Pre-Sale” – a strategy you can use to generate sales for new features of your products or services before you release them – ended up being the most divisive (greatest number of ‘Not Useful’ and least amount of ‘N/A’ votes). Not surprised since I’m not sure how this hack would actually work for books, unless you pre-sold your book in series…but maybe that’s a story for another day. Course creators tended to follow the overall trend, with two exceptions: They found the most irrelevant hack to be “#7.  The Podcast Multiplier” (all about leveraging podcasts to get traffic) and, like those launching a book, they found “6. The Rolling Pre-Sale” either really useful, or not at all. As it turns out, those looking to launch a software product found “#4. The OPA Method” (a strategy focused around generating traffic by leveraging the audiences of influencers) as the most useful. This hack also had the most ‘Useful’ votes and least amount of “Not Useful” votes, which shows that it was surprisingly useful across the board for software creators. Those looking to launch a service found “#5. Epic Lead Magnets” as far and away the most useful hack. Not only did it get the greatest number of ‘Useful’ votes, it did so with the fewest amount of ‘Not Useful’ and ‘N/A’ votes combined. #1. Individuals who want to launch a book are the most cynical. As a percentage of overall submissions, they had the fewest total ‘Useful’ votes, close to the greatest number of ‘Not Useful’ votes, and the greatest number of ‘N/A’ votes. I guess the takeaway here is tread carefully when helping authors ;). #2. Individuals who want to launch software are the most optimistic. As a percentage of overall submissions, they had the greatest number of ‘Useful’ votes (they voted things ‘Useful’ 4% more often than the next highest group – those looking to launch a course, and 23% more often than those looking to launch a book), and the fewest number of ‘N/A’ votes. I take this to mean that people developing software see the massive upside if they get their lead gen, lead capture, and lead conversion processes right. #3. Individuals who wanted to launch a course are the easiest to please. As a percentage of overall submissions, they had the fewest number of ‘Not Useful’ votes. A good sign for anyone helping course creators to succeed :). I have no idea what you can do with this information, but I thought it was entertaining, so I wanted to share it with you (and of course, my interpretation could be wildly off, so take it with a grain of salt). So that’s it for this report. What did you think about the data? If I ran a survey in the future, what type of information would you like to see, or trends would you like to explore? How would YOU interpret this information? What am I missing!?!? Love it. Thanks for sharing Tom! With this survey, there is no hesitation to where exactly I am and noticed in the leading capture category My Nightclub sales Page must definatedly change course by studying my web and my blog real good. Then to continue with Masterclass strategies until OPA method. I guess I should start seperating my wheat from my chaff and ordinate how to standardize the selling, auctionize, launch and servicing. Very Cool, thanks.